← Alternatives to sugar…and are they really healthier? I remember going to an elegant champagne and dessert party one evening when I was living in Miami. I hadn’t had dinner. It was an incredible spread of desserts including the most beautiful cakes, tarts, combinations of chocolate and fruit, and even mille feuille. After my 3rd bite of dessert, I found myself sneaking back into the hostess’s kitchen, peeking into her fridge and cupboards for a jar of olives or a piece of cheese…anything piquant or salty to balance, no, eliminate, the sweetness. Not very elegant but very necessary and totally worth it when I found some spicy bagel bites. If I had to choose, I would take savoury over sweet, every time. A packet of crisps over chocolate cake, I used to be fond of saying. I need to find more wholesome examples of sweet and savoury snacks to make my point! For many people, like myself, keeping healthy and fit is a serious commitment – I have to watch what I eat very carefully and I have to exercise pretty vigorously at least 4-5 times a week. My weakness is salty crispy snacks like crisps, pretzels, salted roasted nuts and a whole range of Indian snacks including mathis, chevda and chakris which are…eek…deep fried. It isn’t just the savoury taste but also the satisfying crunch they offer – texture is incredibly important when it comes to food! Naturally, I’ve been experimenting with healthier but almost-equally satisfying versions of my favourite crispy snacks. Here are two of them. This recipe is so easy, so tasty, and I couldn’t believe how crispy the chickpeas turned out. 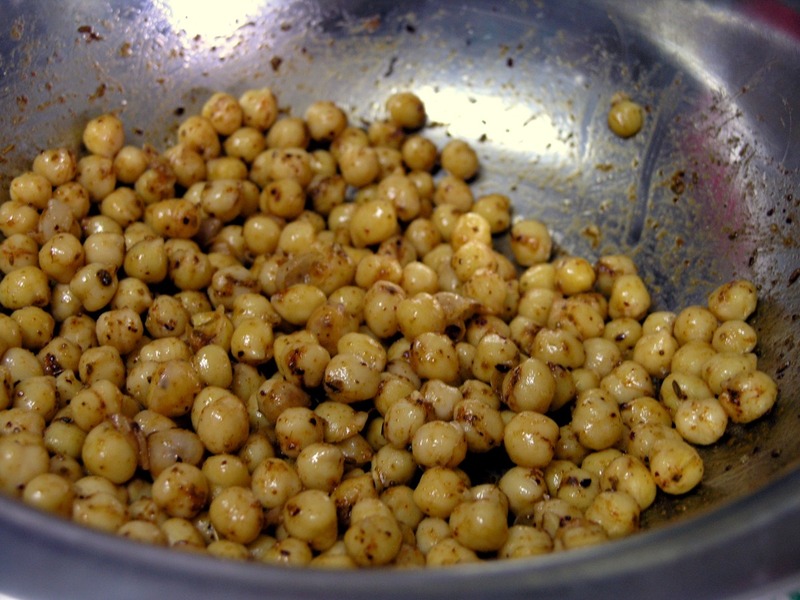 Toss the rinsed & dried chickpeas in the oil, spices and salt. I encourage you to experiment with different types and quantities of spices to suit your palate. Lay out the chickpeas on a baking tray lined with grease-proof paper. Put in the middle rack of the oven and roast for 15 minutes. Open the oven door, toss the chickpeas and roast again for another 20 minutes, you may need longer. They should be deep golden brown and hard to the touch – they will crisp up more as they cool. Let them cool and enjoy with an ice cold beverage of your choice! Per serving: Calories 136, Protein 6g, Carbohydrate 18g, Sugars 3g, Fat 5g, Saturates 0g, Fibre 5g. 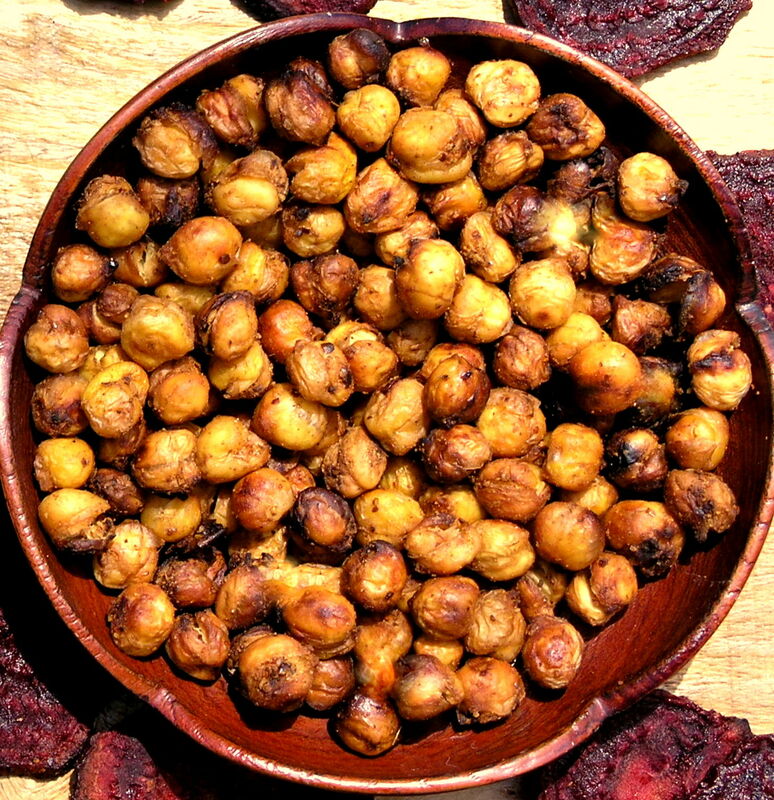 Dietary Fiber and Folate, and a very good source of Manganese. Line 2 baking sheets with grease-proof paper and spray with oil or brush lightly with oil. 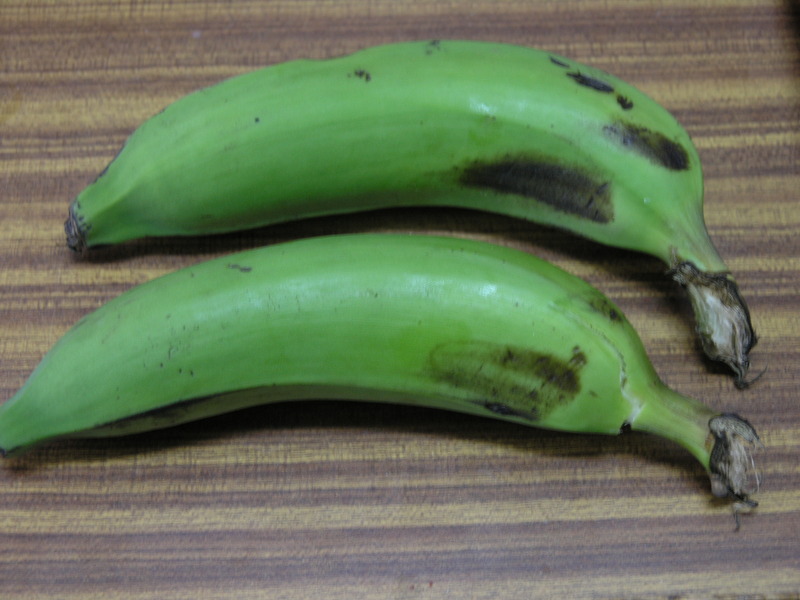 Green bananas and raw plantains can be hard to peel – you will need a sharp knife and some patience. After peeling, slice thinly, about 2mm thick slices. 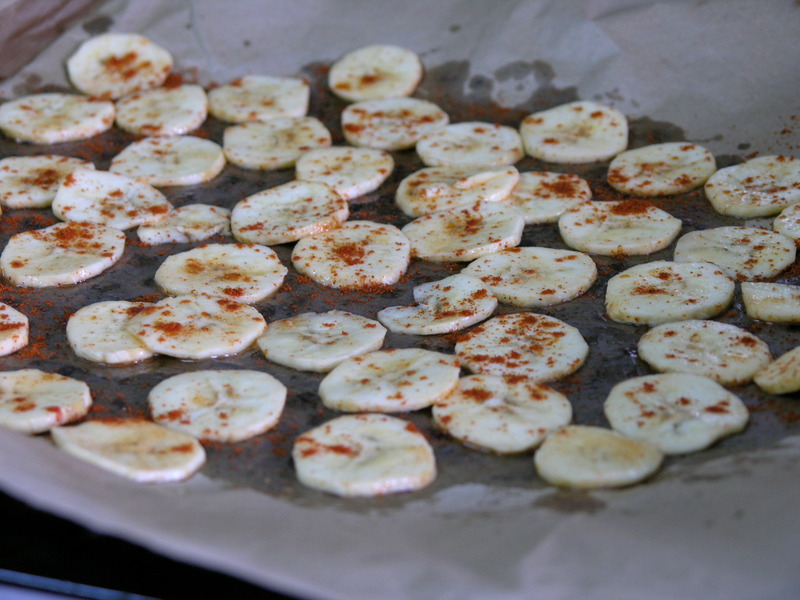 Lay them out flat on the baking sheets and sprinkle with salt and chilli powder, make sure they don’t overlap. The slices are overlapping slightly in this photo, they shouldn’t be – I spread them out more so they weren’t touching just before baking. Bake both trays for 25-35 minutes, until you see that the chips are starting to brown slightly and curl up on the sides. Let them cool completely before eating. As with the chickpeas, they will crispen as they cool. Store in an air-tight container if you can resist eating them all right away. Right before serving, squeeze some fresh lime juice on, that way they won’t get soggy – awesome! Per serving: Calories 107, Protein 1g, Carbohydrate 16g, Sugars 8g, Fat 5g, Saturates 1g, Fibre 1g. A good source of Vitamin A, Vitamin C and Vitamin E (Alpha Tocopherol). 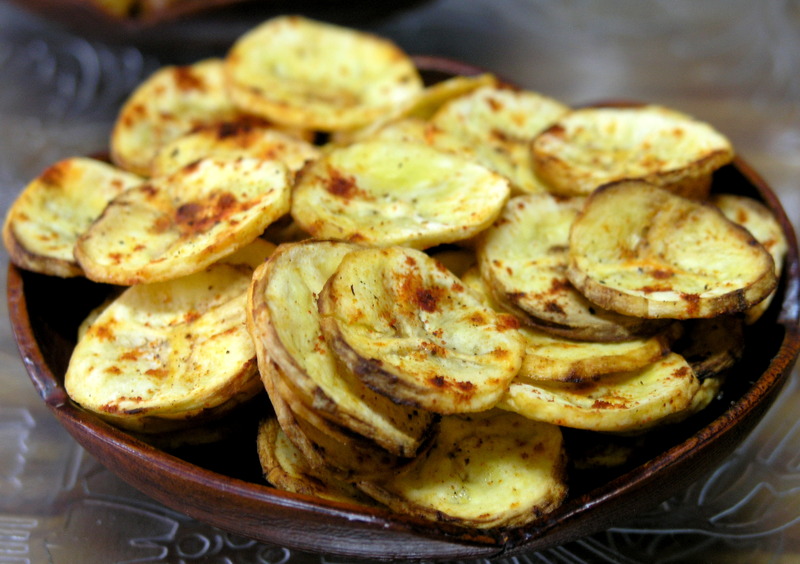 These baked banana chips were delicious! Love this. Can’t wait to try it! Thanks Ron. Really easy and really tasty! These look delicious. I came across your website via your butternut squash salad recipe featured on the Guardian website. As a daughter of Tanzanian born parents I can identify with a lot of the ingredients you use. Some lovely recipes, will be back for sure!